When setting up the Bergland apartments, a thought was at the forefront: the guests should have it as comfortable as possible. The architecture and use of natural materials was in harmony with the Alpine Wellness philosophy. Behind this concept is a reflection on one's own roots and the knowledge about regional nature, culture and quality of life. You will experience the finest amenities here at Haus Bergland. The selection of different apartments is so diverse that you will find the right accommodation for you. In all apartments you will find bath and / or shower, WC, sunbath, LCD TV with DVD and radio, hairdryer, bed linen, towels, dishes and a kitchenette. In the topsuites there are additional appliances such as a microwave, a dishwasher and a tiled stove. Of course you will also find room safes for your valuables in the individual apartments. 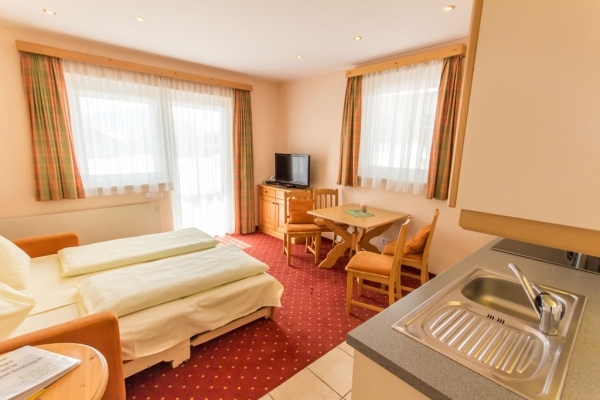 Ski and hiking information is also available, so that you can have an impression of the wonderful Bad Kleinkirchheim and the wonderful surroundings already upon arrival. Ski boot warmers and dryers are another extra service we have provided for you. A highlight in Haus Bergland is the Vital Oasis. Various saunas and a Roman steam bath, the pine or herbal sauna, as well as an infrared cabin, will make you aware of the beauty of relaxation after a hiking or skiing day. Afterwards relax in the relaxation area on wellness facilities and let wonderful holiday days end.